EcoLine Cleaner/Degreaser is a heavy-duty, water-dilutable cleaner/degreaser	for tough cleaning jobs in	industrial and commercial applications. It is ideal for cleaning machinery, shop	tools, hoods,	parts in process,office equipment,	floors, walls,	and	desks. EcoLine Cleaner/Degreaser can be	used on	all engineered	metals	and	alloys. Unlike harmful	or hazardous solvent	cleaners, EcoLine Cleaner/Degreaser	is	safe to handle and non-flammable. EcoLine Cleaner/Degreaser	has	been certified as	a USDA	certified	biobased product and has been awarded USDA	BioPreferreds designated for	Industrial Cleaners and Grease Removers	for	Federal	Preferred purchasing.(www.biopreferred.gov). EcoLine products are based on	soybean	derivatives and soybean oil methyl	esters. These soya-based	products provide	excellent lubricity	and	biodegradability. EcoLine	products are	environmentally	friendly and leave behind	a high-performance Vapor	phase	Corrosion Inhibitor	(VpCI®)	corrosion protecting layer. Available by the Case (12 16-oz. bottles/case, Cortec item # 35903568), 5 Gallon Pail (Cortec Item # 12603557) or 55 Gallon Drum (Cortec Item # 12603558). 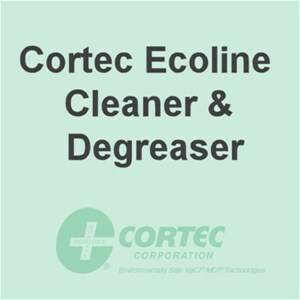 For general cleaning applications, EcoLine Cleaner/ Degreaser	can	be diluted 5-50%	in water. For tougher cleaning and/or degreasing,	apply cleaner full	strength	to penetrate through dirt and grime. Storage:: This product should remain sealed before storage. The shelf life of EcoLine Cleaner/Degreaser is 24 months.